Marvelously positioned on the South Atlantic coast, Rio de Janeiro is the second largest city in Brazil, famous for its cosmopolitan atmosphere and annual carnival. The city of Rio is known for its breathtakingly beautiful landscape, its numerous vivid beaches and for its relaxed, laid-back culture. Visitors often think of Rio as the capital of Brazil but that is wrong as the capital city is Brasilia. Rio de Janeiro, however is in the travel wish list of many tourists. The city is among the most visited settlements in the Sothern Hemisphere. Holiday makers come to Rio for its long and lovely beaches Copacabana, Leblon and Ipanema, for the statue of Christ The Redeemer on the top of Corcovado Mountain, for the site of the Sugar Loaf Mountain with its cable car, for the famous stadium Maracanã – one of the largest football stadiums in the world, for the samba and bossa nova and naturally, for the yearly celebration of the Carnival. In 2016 Rio de Janeiro hosted the Summer Olympics and the Summer Paralympics. The city of Rio de Janeiro is so vast and has so many interesting sites that the best way to see most of them is by getting one of the car rental deals. Nicknamed “the marvelous city” Rio is situated on the far western part of the Atlantic coast of Brazil between Cabo Frio, Costa Verde and Ilha Grande and is very close to the Tropic of Capricorn. The city was founded on an inlet and the entrance to it is done through the Sugar Loaf land. The very center of the city is positioned on the plains of the Guanabara Bay. The largest part of the city known as the North Zone is extending to the northwest on plains and rocky mountains. The South Zone is reaching the beaches and is home to many of the Rio landmarks, hotels and important sites. The city of Rio de Janeiro is occupying an area of 1182 sq.km and its population is around 6 million people, while the population of the greater metropolitan area is around 14 million people. The harbor of the city features an interesting entry from the ocean which makes it appear to be the mouth of a river. The harbor is further surrounded by the Sugar Loaf mountain, Corcovado Peak and the hills of Tijuca. For all those reasons, the harbor is among the Seven Natural Wonders of the World. Why visit Rio de Janeiro? There are many reasons to visit Rio on a vacation or to come for a longer stay. Yet, the main reason is that there is no other place on earth like the cosmopolitan city of Rio de Janeiro. The settlement is a combination of many things, landmarks and emotions and should be experienced with an open heart. Travelers can walk through its parks among toucans and monkeys, they can spend the day climbing to the statue of Christ The Redeemer, or they can spend time at its numerous museums and galleries. They can also go and watch a football match at the largest stadium in the Southern Hemisphere – Maracana, or spend a lazy day on Copacabana beach. The evenings can be spend trying the local specialties or dancing samba around Lapa area. The locals are extremely proud of their carioca spirit. They are proud people, but also good hearted and very spontaneous, who love to take everything out of their life. Rio de Janeiro has been recently named the happiest city on earth. It is a fact that once visited, it gets into the hearts of the people forever. Rio de Janeiro is among the top destinations for many travelers from all over the world. It features lovely hills and sandy beaches, and offers inspiring views from the Sugar Loaf Mountain. The city has a vibrant nightlife with an impressive range of night cubs, bars and cafes. It offers diverse accommodation and excellent car rental deals for comfortable sightseeing. The average annual temperatures of the sea is between 23–24°C, around 22°C in the period July – October and 26°C in February – March. The ocean current is known as Santos Bight or the Brazil Current. The wettest months are in December and the driest months are in August. The temperatures in Rio de Janeiro is moderate throughout the year and there is no bad time to visit the city, except may be in the wet period. The summer in Rio lasts from December to March, with the hottest months being December and January. In that period of the year the summer showers are almost every afternoon. At that time is also organized the famous Carnival, the beaches are very crowded and the prices go up. The winter in Rio lasts from July until September. The period is characterized with almost no rainfall and sunny days good for visiting the beach, yet the nights are chilly and cloudy. The temperatures at that time of the year are around 24ºC during the day and 15ºC at night. Since that is not a popular time to visit the city, the price of the accommodation is low and the car rental deals are quite tempting. Winter months are the best time for the surfers to hit the ocean waves. The spring in Rio lasts from September to October and these two months offer great weather for exploring the city. There is almost no humidity and just a few rainy days, while the temperatures are around 26ºC. The conditions are perfect for going to the beach and for hiking in the rainforest, the gardens are full of color and greenery. The prices are cheap and the tourist crowds are still bearable. The spring is the ideal time for trips to the Tijuca Forest, the Botanical Garden and Parque Lage. The climate of Rio is tropical, wet and dry and it borders the tropical monsoon climate, characterized by periods of heavy rain from December to March. In the inland area of the city, it is normal for the temperatures to reach 40 °C during the summer. Along the coast there is a breeze which is blowing onshore and offshore, which moderates the temperatures. Often in the autumn and in the winter the cold fronts from Antarctica reach the city and cause frequent weather changes. Rio de Janeiro is situated on the far western part in Brazil’s strip of the Atlantic coast. It is to be found on the Costa Verde, between the strait east to Ilha Grande and the Cabo Frio. The most popular city in Brazil is placed near the Tropic of Capricorn and is failing southern direction. It was founded on an inlet on the Guanabara Bay with an entrance being the Sugar Loaf Mountain. The most convenient way to explore this huge and lovely city is by making a car reservation for one of the cheap car rentals available. The beaches of Rio de Janeiro are amazing and one of the main reasons for so many holiday makers to choose the city as their destination. The beaches in and around the city are wide and very clean, covered with white soft sand. The main beaches are placed from Leme to Barra area and they offer plenty of services such as clean paid toilets, free showers, wet trails with cool sand, police and life savers, chairs and tents for rent, eateries, cafes and bars. The beaches to be visited here include Vermelha and Leme, Arpoador and Leblon, Barra da Tijuca and Recreio dos Bandeirante, Grumari and the nudist beach Abricó, which is accessible only with the available auto hire. Naturally, the two most famous beaches in Rio are Copacabana and Ipanema. Once a fishing village, Copacabana is situated on the Atlantic shore from Posto Dois to Posto Seis and has historic forts on both ends of the beach, namely Fort Copacabana and Fort Duque de Caxias. In the area are to be found many hotels and residential buildings, restaurants, night clubs and bars, placed on the promenade (4 km long) that is facing Avenida Atlantica. Copacabana beach is very famous spot for celebrating on New Year’s Eve with the 20 min long and impressive fireworks show. The Arpoador part of the beach is a favourite for surfers. Nearby is Fort Copacabana and its wartime museum open to the public. Copacabana is where one can watch the locals play a game of soccer or volleyball, or buy drinks and snacks from the vendors walking around. Ipanema Beach – this long beach has soft white sand, featuring gently rolling waves. Considered to be one of the Best Beaches in the world for many years, it is bordered by a lovely promenade of shops, art galleries, theaters, cafés and restaurants and night clubs. The Ipanema beach is famous for the social life and the elegant development. It is placed next to two mountains called The Two Brothers, but is a part of South Zone, lying between the beaches of Copacabana and Leblon. Ipanema area is famous relaxation zone where are practiced football, volleyball, etc. and where is sold beer and the traditional drink for the country – caiprinha. Worth visited are also the beaches in the island Paqueta. The beaches along Recreio and Barra are preferred by the surfers and the hang-gliders. The finest surf spot in Rio is Praia do Diabo, but it is only for experienced surfers. All beaches of Rio de Janeiro are easily accessible with the affordable car hire that is provided by the reputable car rental companies that have offices in the city. The beaches of Rio de Janeiro are so marvelous that they turn into one of the main reason for the vacation goers to visit the city, along with the Rio Carnival of course. Rio de Janeiro beaches are amazing with their soft and white sand, they are clean and wide, tempting the travelers to reach them. Most of the beaches in the city are easily accessible, though for a full reach to all beaches in the area, the holiday makers should better get the affordable car hire that is provided by the local car rental companies. RIO.zip | 24h in Rio de Janeiro from Diego D’Andrea on Vimeo. The main beaches in Rio de Janeiro which spread from Leme to Barra are providing numerous services for all holiday makers. Some of the facilities that are offered include free showers directly at the beach, special wet trails that are very pleasant for walking on the cool sand, as well as many tents and chaise lounges that could be rented. There are also life guards, police patrols, clean paid toilets. The choice of eateries, cafes and alcoholic bars is really impressive. The beaches of Rio de Janeiro are tempting for all people – young and old, rich and poor, etc. They all come here to swim, to enjoy the sun, to play various sports, enjoying the ocean waves and the green peaks nearby. The sports that could be practiced in the area include cycling and skating, paddle boarding and jogging, volleyball and football, and that special Brazilian sport futeevolei, a combination between volleyball and football. Naturally, some of the visitors on the Rio de Janeiro beach zone just come to relax and enjoy the view. There are plenty of places for having a nice lunch and a drink. Abricó – that is the only official nudist beach, with oceanic position. It is placed next to Grumari beach, also oceanic. These two beaches could be accessed only by one of the rental vehicles. The waves in Rio vary and could be calm in Guanabara bay beaches or high and perfect for surfing in Recreio. Barra da Tijuca Beach – this is the longest beach in Brazil, which stretches about 18 km from Morro do Joá to the Recreio dos Bandeirantes. Prainha Beach – this is a beautiful beach located 52 minutes’ drive southwest from thee center of Rio de Janeiro. Morro do Leme – placed along the Atlantic coast, Morro do Leme is an environmentally protected area near Copacabana beach..
Make a plan of the beaches you want to relax at in Rio de Janeiro! See our tempting car rental deals! Are you looking for a day on the beach, swimming and relaxing, snorkeling or surfing at Copacabana Beach? Or maybe you prefer hiking and wish to enjoy some great views from the top of the Sugarloaf Mountain? If you are into art Rio also offers a broad selection. Picturesque harbor, wide sandy beaches and fantastic mountains Rio de Janeiro deserves to be called the marvelous city and to be in the wish list of so many travelers. The second largest city in Brazil has a delightful natural setting, a long carnival season and friendly locals that love to party. Are you already browsing the hotel accommodations in Rio and checking the car rental deals? Organize your stay and then make a list with the Rio de Janeiro places to visit during your vacation. The places to be visited in Rio de Janeiro are numerous, as the city is full of historical landmarks, cultural sites, natural settings. Look at the most popular attractions in Rio de Janeiro, which are among the must visit places. This is a beautiful hill that is 710 m high, on the top of which is the statue of the impressive Christ the Redeemer. 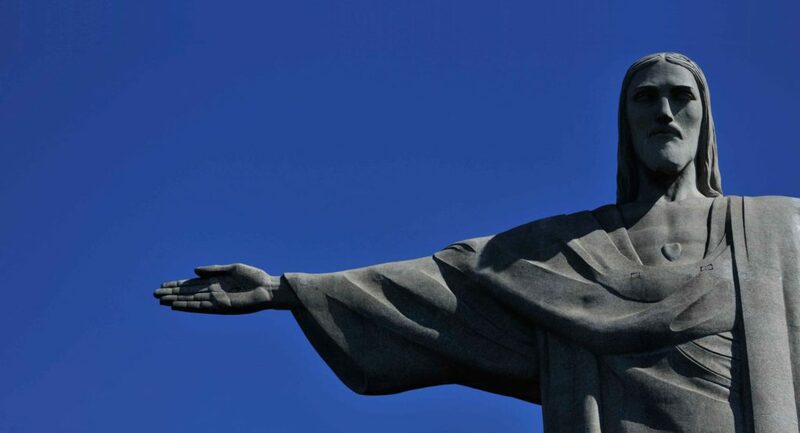 Known in Brazil as the Cristo Redentor statue, it stands out with arms outstretched, looking over the city. Its construction has started in 1922 during the Art Deco era and is made of concrete and soapstone statue. It is believed to be the largest statue of its kind in the world. It reveals a delightful view towards the famous beaches of Copacabana and Ipanema, the Botanical Garden and Lagoa Rodrigo de Freitas. The sights to the inland are towards Maracana Stadium. Corcovado should be visited on a clear day. The statue receives more than a million visitors per year. It is easy to be reached with an affordable car hire, as you can drive all the way up. Visitors can alo take the vertical cog train to reach the base of the summit or climb hundreds of steps to the top. Escalators and elevators are also available to shorten the trip. This site is located across Guanabara Bay, but offers exciting views towards Christ the Redeemer statue and the Sugarloaf mountain. The neighborhood can be reached for 15 min from downtown Rio using a ferry boat. Important landmark of Rio with incredible views over the bay, the beaches and the city center. The best experience and views is at sunset. The twin peaks of Morro da Urca and Pão de Açúcar – lush greenery, monkeys, parrots and toucans, etc. The access is by an aerial cable car that features two sections and services 2000 people each day. On the top of the Sugar Loaf Mountain are to be seen shops, cafes, restaurants and even a cinema. The foot of the mountain can be reached with one of the rental vehicles. This is a large lagoon in the center of the South Zone with views to Ipanema and Leblon beaches, as well as towards Corcovado. Lagoa Neighborhood is an exclusive neighborhood and is believed to be the third-most expensive in South America. It features the large lagoon Lagoa Rodrigo de Freitas and 4 mile path that encircles the lagoon being great place for joggers, cyclists, skaters and paddle boat rides. The neighborhood has many open-air cafés and restaurants, worth to be visited. Maracana Stadium – Football is the most important sport in Brazil, while Maracanã Stadium is one of the most famous landmarks of Rio. Several years ago it was the highest capacity football venue. The stadium has been partially rebuilt in preparation for the 2014 World Cup and is now can seat 80 000 spectators, thus becoming the largest stadium in South America. It also features and interesting Soccer Museum. A famous beach in Rio with one of the most amazing sunsets. A nicely kept botanical garden set east of the lagoon, considered as one of the most marvelous parks in Rio. There are sunny beaches and shady alleys, statues, ponds and fountains. Established in 1808, today the botanical gardens are among the most important in the world, home to a forest of giant bamboo, ferns, orchids (600 species) gint cacti, and also parrots and hummingbirds, butterflies and monkeys, etc. Onsite are to be found many monuments and fountains, a Japanese garden and a water lilies pond, etc. That is a great vacation stop and best reached by car. Instituto Moreira – modern white building, home to an important collection of Brazilian art, fantastic courtyard and mural. Inside is to be seen the best private collection of photography in Brazil, as well as several rich exhibitions of painting and sculpture. In addition, there is a temporary exhibition hall as well, plus cinema, library and cafeteria. Museu de Arte Contemporânea Niteroi – Museum of Contemporary Art, featuring temporary exhibitions of modern art. The UFO shaped building by architect Oscar Niemeyer is placed across the Guanabara Bay in the city of Niterói and can be reached by ferry or a car rental through the the 13 km long bridge President Costa da Silva. That is a seventeenth century Benedictine monastery with a church on a hill in the center of the city. The exterior is simple but the interior is decorated with extravagant gold leafs. Is a national park that embraces the city with its lush forests. It features walking trails and reveals some of the best views of the city, as well as the highest peaks of river. In fact that is one of the largest urban parks in the world. An interesting store with a variety of library records and scores of bossa nova. Rio de Janeiro is a marvelous city and a melting pot of cultures. It is home to more than six million people of various races which turns it into a true gem in the very center of South America. In Rio de Janeiro all people are welcome and all people can find something of their interest. That is why Rio is a great starting point for trips to Brazil with so much to see and so many attractions to be visited. Most probably the travelers have already rad about the major sites that deserve to be seen in Rio de Janeiro. Below will be presented several others that are worth the trip with the rental vehicles. Santa Teresa Neighborhood – this romantic Rio district is located on a hill and is looking towards the harbor of the city. The neighborhood brings the travelers a few steps back in time, presenting them with the elegant look of Rio de Janeiro during the 19th century with its cobblestone streets and plantation mansions. The district is a gathering point for many musicians, artists, and writers. It is also a place with modern dance clubs and boutiques. Lapa Neighborhood – this district is positioned in the downtown zone of Rio and was once home of the red-light district of the city. Nowadays, the area is popular for its vibrant nightlife, its samba bars, the music. The 1800s architecture of the neighborhood is ideal for the numerous festivities organized here. This is ideal place to try the local cuisine while drinking caipirinha. Tourists should know about the steps Escadaria Selarón, which connect the neighborhoods Lapa and Santa Teresa. Tijuca National Park – this is among the largest urban forest in the whole world. It has mountainous landscape and visitors are allowed to climb to the Rio’s highest peak – the Pico da Tijuca. Therefrom they can see panoramic views towards Guanabara Bay and Rio de Janeiro. The onsite attractions include the tumbling 100-foot Cascatinha Waterfall and the Mayrink Chapel with murals painted by the famous Brazilian painter Cândido Portinari. If planning a trip to Rio de Janeiro, read about our car rental services and pick the best economy car rental you can get! These are just some of the interesting sites in the city of Rio de Janeiro. In fact, it has much more than these, so planning a stay of many days in the city is advisable. Rio de Janeiro is one of the major transportation hubs in the country, being second only to São Paulo. The easiest way to reach the city is by plane, using the Galeão – Antônio Carlos Jobim International Airport and the domestic Santos Dumont Airport. The international airport is situated 20 km north of Rio’s center, easily accessible through the airport rentals and the airport shuttle service. The airport handles numerous daily flights to and from Europe: Lisbon and Porto, from Madrid and Paris, from Frankfurt and Rome, from London and Amsterdam; to and from the Middle East and Africa: Dubai, Addis Ababa, Luanda; to and from North America: New York and Atlanta, Dallas and Huston, Miami and Toronto, Mexico and Charlotte. Galeão – Antônio Carlos Jobim International Airport further has connections to Middle and South America, as there are flights to Argentina and Venezuela, Uruguay and Paraguay, Colombia and Chile, Panama and Peru. The domestic airport Santos Dumont Airport is placed near the city center by the Guanabara bay and offers flights to many large cities in Brazil including Sao Paulo, Porto Alegre, Belo Horizonte, Salvador, Brasilia, etc. The two airports have nicely organized airport terminal buildings with various facilities provided to the travelers, including airport map and airport car parking area. Further service is available by the local bus network system. The city of Rio de Janeiro is served by many expressways and even so traffic jams are quite common as the city is quite large and populated. Since in Brazil most of the interstate transportation is done by road, there is a large terminal for long-distance buses located in the neighborhood Santo Cristo, two port facilities, and good roads to all neighbor states. The quality of the highways has strongly improved, yet that led to an increase in the toll fees. Car hire insurance is obligatory in the country and provided by all car rental companies, which offer excellent service and cheap car rentals, leaving the holiday makers with enough funds to spend on sightseeing, dining out and shopping. The best way to explore the beautiful and vast city of Rio de Janeiro is by getting one of the cheap car rentals offered by the car rental companies and online in advance through the website coconutcarrentals.com. Even if traffic is some parts of Rio can be overwhelming, using a holiday car hire might be the best way to reach some distant places like Grumari beach. Drivers should try to avoid the rush-hour traffic jams in some of the neighborhoods such as Copacabana, Laranjeiras, Botafogo, and Tijuca. A wise thing would be to get an airport map and a GPS device too. Further to know is that between 7 and 10 am on weekday mornings, the traffic flow of one highway on the Ipanema and Copacabana beachfront roads s reversed, which means that the traffic on those roads flows in the same direction, towards the city. Further to that, on Sundays the highway closest to the beach is closed and is used by pedestrians, cyclists, skateboarders, skaters, etc. Rio de Janeiro is a bustling city and one of the frequented tourist destinations for many long decades. It has the status of being the most visited city in the Southern Hemisphere, with a vibrant city centre with rich historical sites and many places of interest. When holiday makers are planning their trip to Rio de Janeiro, they are aware that a great deal of the city’s landmarks are located in the center of the city. Even so, some of the sites are far from each other and the landmarks in the other neighborhoods are also away. For that reason getting an automobile hire is highly advisable. Let’s see which sites are to be seen in Rio de Janeiro city center. Often called just Centro, this is a neighborhood in the center of the city, which represents the financial, cultural and fashion heart of the city. The area has its number of residences, yet the historical buildings and the commercial centers are predominant, as well as the modern skyscrapers. Still look out for some hidden gems from the colonoal period. Parça 15 da Novembro – place for organizing frequent markets for the sale of art and antiques. Therefrom start boat services to Niterói and the Ilha de Paquetá. In the Centro zone are to be found the headquarters of some of the largest companies in Brazil such as Eletrobras, Petrobras, BNDES and Vale. Thee area is quit crowded during the week days and is more pleasant for walking on Saturdays, Sundays, and holidays. Make a car hire comparison and choose the best car hire for a great stay in Rio de Janeiro! Explore the city and enjoy your stay! The second major and largest city in Brazil, Rio de Janeiro, is known for its wonderful natural setting, for its vast urban beach zones and for one of the largest football stadiums in the world. Rio de Janeiro sightseeing deserves a carefully prepared plan, since the city has numerous landmarks and they all deserve to be seen, including the huge statue of Jesus Christ on the top of Corcovado Mountain as if hugging the city, the cable car trip to the top of Sugarloaf Mountain and so on. The city has a well-organized public transport, yet the best way to explore it in comfort and in style is by making car reservation for the affordable car hire provided by the car rental companies in the city. When planning a trip to Rio de Janeiro, travelers should pick the dates, organize their sleeping arrangements and then make car reservation for their holiday car hire. There are two special periods in the year when Rio de Janeiro is full of tourists. These periods are the New Year Eve celebrations and the Carnival in February. If the trip is to be organized at that part of the year, planning in advance is absolutely necessary. New Year’s Eve – on 31st December each year, locals and travelers gather together at Copacabana beach to celebrate the coming of the New Year together. There is a 30 min fireworks show, that is very impressive, many street parties, etc. Rio Carnival – the carnival in Rio is a two-week event with festive floats, samba dancers, competition between the different samba schools, etc. Samba parades are organized in the center of the city, as well as in the different neighborhoods. Call us today and we will give you our best car rental quotes! This is the main reason that brings so many tourists to Rio de Janeiro. The party lasts for two weeks, during which the samba schools parade in the center on a huge structure called Sambadrome. There are parades on the streets as well, in Centro and in the South Zone, and also in almost every neighborhood in the city. In the city are to be found many samba schools as well. If visiting the city of Rio de Janeiro for the time of the Carnival, make sure to place a car reservation well in advance. That may be done online as well, through the website carrentalriodejaneiro.com where are also to be found car rental reviews, car rental tips and all information necessary. Travelers visit Rio de Janeiro for many reasons, yet the main one is the Carnival. The dance party lasts for almost two weeks and gets serious advertisement. It is known for the samba schools presentation and their street parade in the Centro neighborhood on a gigantic structure that is called Sambadrome. In order to see the street parade in the center and the other street dance celebrations in the other districts of the city, travelers should get on of the cheap car rentals available. The first ever celebrated Carnival in Rio de Janeiro was in year 1840, when it was organized as a masked ball. Years passed and the special costumes became a tradition, as the celebrants were choosing more and more colorful costumes. Ever since that year, the Carnival in Rio de Janeiro is considered to be the root of the Brazilian music. It is a celebration in the tradition of the Roman Catholic religion, organized every year. During the Carnival are allowed the merry-making, as well as the consumption of red meat before the Lent period. The tradition of the Carnival parade was influenced by the celebrations held in the German and the French courts. The influence of the Brazilian drums was felt more since the first half of the 20th century. Suvaco do Cristo – this is a band of samba dancers that parades in the area of the Botanic Garden, in the zone just below the arm of the Redeemer statue. Cordão do Bola Preta – this is street parade in the centre of the city, one of the most traditional carnivals attended by more than half a million people in just one day. Banda de Ipanema – that is the most traditional band dance in Ipanema, with a serious range of revelers, families and drag queens. Carmelitas – this samba school band parades in Santa Teresa, a neighborhood with marvelous panoramas. Simpatia é Quase Amor – this is among the most popular parades in Ipanema area and the nearby beach. Samba is a very interesting dance for the holiday makers and the samba shows are quite popular in the city throughout the year. Travelers are welcome to sign for the night practice sessions at the samba schools in Rio de Janeiro. Check our website and make most of the car rental deals! Rio is the birthplace of three of the most important musical genres of Brazil. These are samba, bossa nova and choro. The nightlife in the city is vibrant and busy, and this is the place where travelers can see and hear some of the best musicians in the country. Rio de Janeiro is a big city with many bars and night clubs, and almost all kinds of music can be heard. Travelers can get the program and can find information for the various events from the leaflets left in the hostels, theater lobbies, etc. In the city are organized the largest celebrations in the country for the New Year’s Eve. There are huge fireworks and fantastic music shows usually for free, right on the Copacabana street. Rio de Janeiro is the main destination for guy and lesbian travelers from the country and from all over the world. The city is also famous for hang gliding and paragliding flights, since there is favorable wind and high hills. No training or special device is needed. That sport can be practices in the urban areas and the landing can be on the beach. Rio de Janeiro is an ideal place for hiking and trekking too. Within the city is to be found a forest with hiking and trekking paths. Some of them include Parque Lage – Corovado (quite steep), Sugar Loaf (short and easy path), etc. Panoramic flights with helicopters – that is a splendid way to see the city and make some panoramic photos. Some of the operators include Helisight, Cruzeiro Taxi Aereo, Ds Taxi Aereo. Rio de Janeiro is a great place to learn capoeira – that is a mixture of dance and fight, created by the once enslaved African community. Capoeira is not difficult, it is original and fun. Samba is the national rhythm of Brazil. There are plenty of samba schools in the city of Rio de Janeiro, where travelers can learn the steps. There are also many night clubs where one can practice the samba dance. Learn the language – if staying in Rio de Janeiro for longer periods of time, then attending a course in Portuguese for foreigners might be a good idea. The language courses are at a low price but follow high educational standards. Have you hired a car for your trip to Rio de Janeiro already? Since Rio de Janeiro is among the most famous travel destinations in the world, the city has plenty of great accommodation as well. The travelers have a choice of luxurious hotels, mid-range priced hotel rooms, guesthouses and boutique hotels, serviced apartments and hostels. All these accommodation places can be easily reached with the available economy car rental, provided by the numerous car rental companies that work and offer their services in the city. So, where to stay when visiting Rio de Janeiro? Let’s see the possibilities. See top 30 hotels in Rio de Janeiro here! Along with picking an affordable car hire, choosing one’s accommodation for a visit in Rio de Janeiro city is among the most important things that the holiday makers should decide upon. The things that travelers need to keep in mind is their budget, the purpose of the trip, the number of people traveling together and the type of accommodation that is required. As a rule, the best locations for a stay in Rio de Janeiro are in the Downtown zone and in the South Zone. Copacabana – being the most famous area of Rio de Janeiro, it features plenty of bars, restaurants, hotels. It has all facilities needed, yet it is also a very populated area. Ipanema and Leblon – they are among the most expensive areas of the country, since they offer the best beach in the south zone, and also the best restaurants and bars in Rio. They are not that crowded and are safer as well. Favela – staying here is a unique experience revealing Real Rio. There are many hotels and hostels. The Favela do Vidigal is a great choice and community, with great views over the city. Botafogo – placed very close to Copacabana beach, the Sugar Loaf Mountain, the statue of the Christ, and Lapa, this district comes with an excellent structure and is home to many tourist attractions such as Favela Santa Marta, cultural centers and museums. It comes with lower prices than areas like Copacabana, Leblon and Ipanema, and offers hostels and hotel options. Great night bars as well – Casa da Matriz and Bar Bukovsky. Santa Teresa – often called the ‘Montmartre of Rio de Janeiro’, the neighborhood is set on hills, enjoying peaceful small town atmosphere. It has beautiful colonial houses, restaurants, museums. For this area, travelers definitely need holiday car hire, as most of the taxi drivers do not climb the neighborhood. Look at the car rental deals available with us and pick the best car hire for you! Rio de Janeiro is a primary tourist attraction in Brazil and a famous resort area thanks to its numerous attractions and the 80 km of beaches, the Sugarloaf Mountain and the Corcovado area. That is why the city receives the greatest number of visitors per year to any other city in South America, exceeding 3 million of international holiday makers, not to mention the domestic travelers. Rio de Janeiro has been granted many times as the “best destination” by the World Travel Awards in South America. The city of Rio de Janeiro features world-class hotels, complexes of serviced apartments and hostels. All those accommodation places are easily reached through the available holiday car hire offered by the local offices of the car rental companies. The fanciest and most luxurious hotels in Rio de Janeiro are situated in Zona Sul, along the beaches of Copacabana and Ipanema. Around the area of Catete and Flamengo are to be found many small and much cheaper hotels. Naturally, those travelers that prefer the upscale living will find designer hotels. The accommodation offered in the lower Centro area is preferred by the business travelers as they are close to the business district. However, the area around lacks nice restaurants and entertainment places. Ideal area in Rio de Janeiro to those who are looking for pleasant bed and breakfast service is the neighborhood Santa Teresa. It features nice restaurants and night clubs as well. Hotels in Rio de Janeiro – Lowest price guarantee‎, book here. A great alternative to the hotels available are the apartment hotels, many of which placed in Ipanema area, and all nicely appointed and in good residential areas with not so many tourists. The visitors will find a great selection of apart-hotels that are equipped with all necessary kitchen facilities and other comforts. The travelers can also stay in the private condominium apartments that could be rented on a short-term basis at reasonable rates. Some of the serviced apartments have one week minimum stay and sometimes two weeks minimum stay during the Carnival or during the New Year celebrations. Travelers should be aware that the prices in that period go up. Motels are another option, yet they are to be found in the outskirts of the city. They are seldom used as accommodation by the holiday makers. The hostels are quite common and the most expensive ones are placed walking distance away from the beaches of Copacabana and Ipanema. Rio de Janeiro is a top location for thee travelers, a destination dear to their hearts that promises them long days on the city beaches, fantastic views from the top of the Sugarloaf Mountain and excellent panorama from the statue of Christ The Redeemer. There are many top hotels Rio de Janeiro visitors can stay at, and many car rental companies that offer prestige car hire. So, let’s check the travel accommodation options. Contemporâneo Hostel at Botafogo – a small boutique hostel, furnished with designer furniture from Brazil, featuring Latoog hanging chairs and sleeping four to nine guests. On the ground floor there is a small double room with wheelchair access. The breakfast is served in the patio area, on a nice bar. The guests have access to free Wi-Fi, kitchen, a library and lockers. Oztel, Botafogo – modern place with modern furniture and brightly colored wall tiles, long breakfast bar and great location. The dorms are for 6-14 people, there are also six uniquely designed suites. The staff arranges football games, tours to the Dona Marta favela, visits to samba schools. Close to Ipanema and Copacabana beaches and the city centre. Leblon Spot – trendy hostel on one of the best bar and restaurant streets in the city – Rua Dias Ferreira. This accommodation place is 15 min walk from the beach, the make and the foot of Christ statue. It comes with contemporary design and natural colors. Cama e Café – a lovely bed & breakfast accommodation spot in Santa Teresa neighborhood. Ver pleasant place for a stay, set close to great bars and restaurants. Casa Mosquito – a colonial house in Ipanema district, placed high up the mountain between the beaches of Ipanema and Copacabana. It has beautiful furniture, modern decoration, individually decorated suites with private veranda. Man in Rio apartments – serviced apartments with choice of penthouses and studio apartments in Copacabana and Ipanema, beach houses, and country farms. Perfect accommodation for families, friends and single travelers. Great alternative to the overpriced hotel rooms. Quinta Azul Boutique Pousada – an impressive hotel in Santa Teresa neighborhood, very close to Lapa hill, area for liv music and busy nightlife. The old colonial building hotel has modern interior design, eight suites with private veranda and nice views. The hotel has a garden and a pool, the staff is friendly and the breakfast is tropical. Nearby is placed a trendy Brazilian restaurant. Rio de Janeiro is a hug city with delightful central area and many nice neighborhoods. The travelers that come on a visit here have plenty of options when accommodation is concerned. They can choose from top class hotels, hotels in the middle price range, hostels, serviced apartments, etc. The holiday makers also have a great choice of car rental deals since they will need a vehicle rental if they want to see most of the city. Travelers that are willing to stay in some of the fanciest and most popular hotels in Rio de Janeiro, should head towards Zona Sul. There, along the beaches of Copacabana and Ipanema, the holiday makers will find numerous accommodation options. Those that do not wish to break the bank but still want to stay close to the main landmarks of the city, should try to make a booking at the small and much cheaper hotels around Catete and Flamengo. A great alternative to the hotels in the area, but still a great choice are the serviced apartment hotels that are available in the area. They are nicely appointed, in good residential areas close to the center which are not that crowded with tourists. The business travelers visiting the city of Rio de Janeiro will find comfortable accommodation in the lower Centro zone. The area around is abundant in elegant restaurants and different leisure options. There are plenty of cafes, bars and night clubs as well. The travelers that love to dip into the local atmosphere and take as much as possible from the local culture and traditions during their stay in Rio de Janeiro, are welcome to stay in the central neighborhood Santa Teresa. It features lovely and welcoming bed and breakfast hotels and even if departed from the life in the city center, has its share of vivid nightlife scene. The city of Rio de Janeiro has its share of designer hotels as well. There is a serious selection of apart hotels that offer upscale living with all kitchen facilities in place. These private apartments can be rented out on a short term bases and actually come at quite reasonable prices if shared. Usually, these private apartments have a one week minimum stay. During the New Year celebrations and the Carnival that minimum stay is prolonged to two weeks. Naturally, the prices of the accommodation in Rio at that two festive periods of the year can triple. Since these are the busiest periods of the year, some planning in advance is highly recommended. The hostels are another convenient and cheap form of accommodation in Rio de Janeiro. They are easy to find and some of them are placed very near Copacabana and Ipanema beach. Hostels are quite popular in Rio de Janeiro at the moment, as they are placed walking distance away from the main landmarks and at the same time come at quite affordable price. Holiday Car Hire and useful car rental tips published on our website! Easily identified and overlooked by the imposing statue of Christ The Redeemer, Rio de Janeiro is an iconic city with plenty of attractions, an endless choice of interesting things that can be done, fantastic natural setting with urban beach zones and an incredible samba Carnival that should be seen at least once in a lifetime. It is also a city with a delightful choice of restaurants, bars and night clubs. Getting a pleasant Rio de Janeiro accommodation is not difficult, as there is a serious choice of hotels, serviced apartments and hostels. Planning in advance though is very important, especially if the trip will be during the New Year’s Eve celebrations or during the Samba Carnival. In this case, an early booking is strongly recommended and this is also valid for the car reservation as well. All the accommodation places in Rio de Janeiro are easily reachable with the available holiday car hire. When planning a trip to the city, travelers can choose from a wide selection of Rio de Janeiro accommodation options. They have a close of five star hotels, hotels of the mid price range, serviced apartments, apart-hotels and hostels. Before choosing their Rio de Janeiro accommodation, it is a good idea to learn their way around the city. Centro – this zone includes the neighborhoods Lapa and Santa Teresa. The city’s business and financial area has many historic buildings including the Municipal Theatre, National Library, Tiradentes Palace, National Museum of Fine Arts, Metropolitan Cathedral and Pedro Ernesto Palace. Zona Sul – or the South Zone is including the beaches of Copacabana, Leblon and Ipanema. Here are also located some upscale neighborhoods and most of the major tourist sites – Corcovado Mountain, Sugar Loaf Mountain and Rodrigo de Freitas Lagoon. Zona Norte – or the North Zone, where are to be found the National Observatory, the Maracanã stadium, Quinta da Boa Vista Park with the National Museum the city’s Zoo, and more. Zona Oeste – the West Zone with its districts of Barra da Tijuca and Jacarepaguá, as well as its beaches. Travelers should go through the map of Rio de Janeiro and pick the area and the accommodation that will be best suit their needs, budget and requirements. Among the good hotels in Rio de Janeiro are Caesar Park Ipanema, Copacabana Palace Hotel, Hotel Fasano, Intercontinental, JW Marriott Hotel Rio de Janeiro, Rio Atlantica, Hotel Santa Teresa, etc. All the accommodation spots in Rio de Janeiro are easily reachable with the affordable car hire, provided by the car rental companies. The accommodation in Rio is most probably the most expensive in Brazil. Even so, there is a shortage of hotel rooms in the cheaper range and thus reservation in advance is recommended. Rio de Janeiro is such a vast city and so wonderful that there is a serious reason for it to be among the must see places in the wish list of many travelers. And when the budget for the vacation is in place, the accommodation is booked and the car reservation is made, the holiday makers should make a plan of their daily itinerary. In this way they can organize their sightseeing trip in such a way as to be convenient with the holiday car hire, while they see and reach every landmark that is there to be seen, explored and enjoyed. So, What to see in Rio de Janeiro? Corcovado – the holiday makers should definitely climb Corcovado Mountain and see the statue of Christ The Redeemer at the summit. From the top the travelers can see the two zones of Rio – the northern and the southern one, divided by the steep mountains of Serra da Carioca, which are part of the Parque Nacional da Tijuca. Sugar Loaf Mountain – also known as Pao De Acucar, also revealing great panoramic views towards the city. The top (396 m) is reached with two cable cars and is the best place to be at sunset. The Beaches of Rio de Janeiro – there are plenty of beaches in Rio de Janeiro. The most famous one is Copacabana, which is spreading over 4.5 km along the coast of Rio de Janeiro. The richest beach in the city is called Ipanema. Some of the other popular beaches in the city area include Flamengo, Arpoador, Pepino, and Barra da Tijuca. Armacao de Buzios Resort – approximately 2 hours north of Rio driving an affordable car hire, on Costa do Sol is to be found Cabo Frio Peninsula and this lovely resort. It features a dozen of sandy coves, secluded beaches, little boats and romantic atmosphere. Easily accessible with the cheap car rentals. Go to a Football Match – Rio de Janeiro is home to the largest stadium of the Southern Hemisphere. Attending a football match there is delightful. Some of the tour operators in Rio can book VIP seats for the main matches. Maracana Stadium is an iconic place and home to four of the biggest football teams in Rio: Botafogo, Vasco da Gama Fluminense and Flamengo. Very easy access with the advantage rental car options. Favelas – travelers are also visiting the hillside slums called favelas. In Rio are to be seen 600 of these favelas and they are very picturesque at night. Botanical Garden of Rio – it is situated at the foot of Corcovado Mountain, right below the right arm of the statue of Christ The Redeemer. It spreads over 140 hectares and features 6000 different species of tropical and subtropical plants, and also 900 different types of palm trees. The Botanical Garden in Rio is among the largest natural sanctuaries in the world. Lapa – this is a nice neighborhood located just off the center of Rio de Janeiro. It is placed away from the hotspots of Copacabana and Ipanema. The district has vivid cultural life, numerous bars and restaurants, as well as samba bars on the cobbled streets. Rodrigo de Freitas Lagoon – often called just Lagoa, this is a natural lagoon in the Southern Area. The lake is connected to the ocean by a narrow canal that runs through the park Jardim d’Alá and is surrounded by the districts of Leblon, Ipanema, Jardim Botânico, Copacabana and Botafogo. Tijuca Forest – this is part of the largest urban rain forest in the world and it is placed in the very heart of Rio de Janeiro. A major tourist hot spot, Tijuca forest can be reached through Sumaré Road, Dona Castorina Road, Almirante Alexandrino St., Vista Chinesa Road, Açude da Solidão Road, Redeemer Road and through the Waterfall. Check the car rental deals available with us! Holiday makers love to come to Rio de Janeiro for numerous reasons, including the relaxed and easy-going atmosphere, as well as beach lifestyle. The sun-soaked city has plenty to offer from lazy afternoons on Copacabana Beach to samba dance on the streets during the Carnival in February and fantastic choice of dining places, cafes and night clubs. In search of the good life, the holiday makers are advised to get one of the cheap car rentals provided by the car rental companies that can bring them to all parts of the city and on interesting daily trips. So what to do in Rio de Janeiro? The city of Rio de Janeiro is home to three important musical genres – choro, samba and bossa nova. During the recent years there has been a boom in the traditional venues and dance schools for samba and choro. Many of these are placed in the downtown neighborhood of Lapa. In some of the clubs there can be seen and listened to some of the best musicians in Brazil. As a big city, Rio de Janeiro features small and big clubs that play all kinds of music. The local underground scene is rich in rock, rap and e-music. The best place to find out those places is from the flyers that are left in the hostels, nightclubs, theater and cinema lobbies. On New Year’s Eve in the city of Rio de Janeiro is organized one of the best and most spectacular celebrations. Every year are lit huge fireworks and are organized fabulous and free music shows of local and international musicians that aim to attract more than 2 million people on the sands of Copacabana beach. As a rule locals dress in white and toast the arrival of the new year for luck. Rio Carnival is organized every February and lasts for two weeks. During the Carnival the samba schools are presenting their new dances on a street parade held in the Centro neighborhood. The samba schools dance on a gigantic structure which is named Sambadrome. Street parades are organized in other parts of the city too. In order to enjoy all of them and make most of the Carnival in Rio, travelers usually get an affordable car hire. Samba shows are very popular during the other periods of the year as well and they are in the focus of many people who head towards Rio de Janeiro. Rio de Janeiro is an exhilarating city that seduces the travelers with the samba rhythm, it numerous and long beaches, its stunning mountains and deep blue sea. It is also a city of hectic nightlife with impressive restaurants, trendy bars and busy night clubs. The second largest city in Brazil is a melting pot of colors, races, creeds, all of which being friendly and helpful. The city is welcoming and busy, a place with so many attractions, landmarks and things to be done. It is a city of fine living and relaxed atmosphere. Rio de Janeiro is a settlement of large proportions and an endless choice of landmarks and thus the easiest way to explore it is by using one of the car rental deals that are available. The choice of airport rentals and onsite vehicle hire is impressive, while the making of car reservation is simple and fast. There are numerous ways that one can spend his Rio de Janeiro vacation. The trip can start from the historic neighborhoods of Rio and proceed to the artistic urban neighborhood of Santa Teresa, followed by a nice dinner at one of the best restaurants in the city hidden on the cobblestone streets in the center. Rio de Janeiro vacation can start with a visit to all major landmarks as well, followed by several lazy days on the beaches of Copacabana and Ipanema, enjoying the sun and people watching until dusk. It can also be a Rio vacation dedicated to the famous colorful Carnival, watching the samba schools competing, dancing on the streets. It could also be a Rio vacation for celebrating New Year’s Eve, dancing samba and bossa nova – two dances that emerged here. Naturally, Rio de Janeiro vacation would never be complete without a cable car ride to the top of the Sugarloaf Mountain, or photos taken from the top of the Corcovado Mountain and the statue of Jesus Christ the Redeemer. Travelers heading on their first Rio de Janeiro vacation should know that leaving the city at the end of the trip is not easy at all. Tourists get a feeling of longing to come back, to be seduced again by this incredible, lively city. Organizing Rio de Janeiro vacation? Do not hesitate us and contact us today to get our best car hire options! Holiday makers that want to see Rio de Janeiro, the city where samba was born, have two choices. They can either take one of the offered Rio de Janeiro Vacation packages or they can plan their trip alone, booking flights and making car reservation for one of the car rental deals that are available. Whatever choice the visitor makes, one will always enjoy the natural wonders of this amazing city with lively cosmopolitan atmosphere. Rio de Janeiro is positioned on the southeastern coast of Brazil and has splendid geography, mountains of deep forest and white sand beaches. The city offers real opportunity for various outdoor activities since there are many parks and green zones. As a former capital of Brazil, the city of Rio has rich history and modern culture, not to mention the exciting celebration as the samba schools parade during the Carnival and the fireworks on the New Year’s Eve. The city is ideal destination for a family trip, for a fun holiday with the children, for a romantic trip, and even for an all-inclusive holiday. The perfect Rio de Janeiro vacation packages are the ones that combine affordable flight prices and reasonably priced accommodation, as well as an option for cheap car rentals. Celebrating New Year’s Eve on Copacabana Beach watching the splendid fireworks show or just going swimming there. Ride a cable car to the top of the Sugarloaf Mountain for marvelous views towards the city, the beaches and many landmarks. Climb the Corcovado mountain with the statue of Christ the Redeemer. Enjoy yourself at this free landmark, one of the new Seven Wonders of the World. Have a walk at the Tijuca National Park there which is part of this mountain and is a great place to connect with nature. Watch a football match at the world famous Maracanã Stadium and then buy some souvenirs at the sports museum. Go out – Rio de Janeiro has fantastic restaurants where could be tried delicious local meals. The city also features vibrant nightlife with live music scenes and many places to watch the talented samba dancers. The city is ideal for bar hopping and dancing until the morning hours. Rio de Janeiro city is not far from the Iguacu Falls, so travelers that have enough days in Rio can thing of a trip to this nature wonder as well. Car rental services and tempting car rental tips available on our website! Rio de Janeiro is among the most exciting and exotic places on earth and is definitely on the must see wish list of many travelers and day dreamers. The sun-soaked city has marvelous beaches, lovely sites and huge parks, plenty of attractions and places of interest, as well as exciting night clubs. The city of Rio, however, can be quite overwhelming as it is very large in size and has many districts. The best way to explore the city of Rio de Janeiro is by making a rental search and a car reservation of one of the car rental deals. Another option to see the city is by booking one or several of the Rio de Janeiro Tours that are available. The tours in Rio de Janeiro are numerous and they can please every taste. There are sightseeing tours organized for larger groups that follow a certain route, but there are also tailor-made private tours that are for much smaller groups. The tour guides are usually locals, who know the city well and are informed about its past, the history of the sites visited, and also the program of the night clubs. The sites covered on the Rio de Janeiro Tours depend on the program of the tour and the wish of the tourists. Usually all major sites are visited such as the Corcovado hill with the statue of Christ the Redeemer, the Sugar Loaf Mountain, the Football Stadium Maracana, the neighborhood Santa Teresa, etc. On such tours the visitors can take more than 100 photos, so getting an extra battery pack is advisable. Let’s take for example one exemplary tour in Rio de Janeiro. That would be the Carioca Expedition tour that lasts for five hours. It offers the travelers the chance to see most of the major attractions in Rio de Janeiro. The day tour starts with picking up of the travelers from their hotel by a professional tour guide who speaks English. The tour is done with a mini bus and the group is usually around ten people. The first stop is at the beach Sao Conrado and the hang gliding landing area there. The views that are revealed are marvelous. Then the tour proceeds to the greenery of the tropical rainforest Tijuca National Park and then the group heads to the statue of Christ The Redeemer. This is where most of the photos are made – towards the statue and in all directions of the city. The time for these photo sessions is long enough, so travelers should not worry. The Rio de Janeiro tour then proceeds to the traditional neighborhood of Santa Teresa, being one of the oldest districts in the city, keeping much of its original architecture and atmosphere. After a pleasant walk in the area, the tour goes to The Great Madness and the secret steps of Lapa. Then this exemplary tour in Rio de Janeiro can end up with the travelers being dropped at the Sugarloaf Mountain to enjoy the sunset view towards the city or could be left in front of their hotels. This is just one of the numerous Rio de Janeiro Tours that can be enjoyed. There is also a choice of off-Rio getaways that include trips to Armacao de Buzios, Paraty, Ilha Grande, Angra dos Reis, Penedo. Land and Air Tours are also available including trips to the beautiful Iguassu Falls, the Amazon Jungle, Salvador and Pantanal Safari. Lush mountains and wide beaches of fine sand, vivid carnival with samba dance competitions, spectacular football matches and splendid panoramic views towards the city – that are some of the things that Rio de Janeiro offers. Plan your vacation here by booking your accommodation in advance and by making car reservation at one of the car rental companies. There are many travel guides for Rio de Janeiro and it is highly advisable for the travelers to read them or at least to be aware with the main ones before the trip. Visiting Rio de Janeiro with a plan about the sightseeing day per day is very important, especially if coming just for a few days. Getting one of the cheap car rentals is also crucial, so that travelers can see as much of this cosmopolitan city as possible. There are two places wherefrom can be enjoyed panoramic views over the city and these are the top of the iconic 710 m high Corcovado Mountain with the impressive statue of Christ The Redeemer; and the 396 m high Sugarloaf Mountain placed at the Guanabar Bay in the Atlantic Ocean, placed between Babylon Mountain and Urca’s Mountain. Both places are ideal for practicing various outdoor activities such as cycling along the lake and the beaches, hiking at the Tijuca rainforest, sailing across Baia de Guanabara, and also rock-climbing and surfing, hang-gliding, etc. Music is in the blood of all locals, who love samba and bossa nova, funk and hip hop, rock. Samba is especially associated with Rio de Janeiro. It has African influences and is practiced in many samba schools, in live music halls or directly on the streets. The rhythms of Rio are directly associated with the busy nightlife. The city has a vibrant dance scene every single day. Yet, on two occasions the entire city is a party area and that is during the New Year’s Eve celebrations in December and during the two weeks of the Carnival in February. During these two events the city demonstrates its celebratory spirit, its lust for life, its samba festive nature. The second largest city of Brazil, Rio de Janeiro, has a plethora of captivating beaches. Two of them have become symbol of the city and these are Copacabana and Ipanema. These two beach areas are preferred by the holiday makers and by the celebrities who love to be seen there. The locals prefer the beaches in the backyard of Rio, which provide an endless choice of activities such as surfing and swimming, practicing volleyball and football, snacking and drinking or just watching the people go by. Rio de Janeiro has everything that the traveler might need. The city is abundant in lovely dining places and watering holes for every taste and liking. Very popular are the buffet style restaurants, where visitors pay by the weight of the food they have taken on their plates. Those who are really hungry can ty the rodizio restaurants which work on the principle ‘all you can eat’. They come in different types – some of these restaurants serve grilled meats, other serve rich seafood including lobster and shrimps, clams and calamaris, shellfish and mollusks, still others serve pizza, pasta and appetizers. Since Brazil has a large Japanese population, the sushi restaurants are popular too. The high-end restaurants are situated at Dias Ferreira Street in Leblon. The health food shops are also quite popular and they serve vegetable and meat sandwiches, as well as fruit drinks. As for the drinks, Rio features many open juice bars where travelers can try juices from almost very fruit they can think of. Holiday-makers should definitely try açaí and guaraná juices, as they are among the strongest anti-oxidants and energizers in the world. The national drink and definitely a must try is Caipirinha. This is a drink made of the Brazilian liquor of sugarcane juice – cachaça, with added lime, sugar and plenty of ice. This could be a very pleasant past time activity, since Rio has many stores on the streets where the travelers can bargain, as well as numerous malls such as Shopping Iguatemi and Shopping Tijuca, Shopping Leblon and Shopping Rio Sul, BarraShopping and São Conrado Fashion Mall. The items that tourists buy are usually overpriced but even so they are not that expensive. The things that travelers buy as gifts for friends or souvenirs for themselves include bottes of caipirinha, coconut water, typical Brazilian hammocks. A fantastic choice of gifts are the locally produced bikinis, since they are a trademark for the city and are known as a fashion and quality gifts. The payment of the goods can be done in cash, or with Visa and Mastercards. Just like all tourist zones with so many visitors, there are certain rules to be followed. Those that wish to make most of their stay in the second largest city in Brazil, should get to know the following Rio de Janeiro Travel Tips. When going out sightseeing in Rio or samba dancing at the numerous night clubs, travelers should always leave their valuables in the safe of the hotel or inside their serviced apartments. This is also valid for the important documents, like the passport. Tourists should be careful when walking in crowded areas and should avoid travelling alone, especially at night. Always exchange money at the airport or at the bank branches in the city. Trip to Rio is ok during all seasons as the city enjoys tropical climate and mild temperatures. The public holidays include New Year’s Day; Independence Hero Tiradentes (21 April); Labor Day (1 May); Independence (7 September); Memorial (2 November); Proclamation of the Republic (15 November); Christmas Day. Tipping is not compulsory in Rio de Janeiro and is not expected from the locals. There are serviced charges of approximately 10 % that are added to the bills. Additional tips are accepted as an appreciation for the good service. The buses are the cheapest means of transportation in Rio, yet the most comfortable one is by getting an automobile hire. Ample parking is available at the large stores and some restaurants. Drivers should avoid the traffic jams, typical for the working days and especially on Fridays when many locals lave the city. Car hire insurance is obligatory. Ok, learning a brand new language is not easy at all, but learning a few common phrases is not difficult and is highly appreciated by the cariocas (the natives of Rio). Try to learn a few phrases in Brazilian Portuguese that is used in the city – several greetings and courtesies, learn how to ask for directions and how to pay. There are many colorful neighborhoods in Rio and getting to know them is advisable. Some planning in advance is needed for Rio, as it is a large city with plenty of landmarks. Since the atmosphere of Rio de Janeiro is intoxicating and since travelers from Europe and from the United States do that trip only once in their lifetime, they should always think of a way to prolong their stay with a few more days. Great places to see near the city are the Iguazu Falls, the capital city of Sa Paolo and the small fishing village of Paraty. Excellent car rental services for your vacation in Rio de Janeiro!